I can’t believe this book is finally out and I have read it. Months, years of anticipation and now it’s over once again… I did have some difficulty rating this. I wanted to rate it all the stars if only for the nostalgia and emotional factor. But it’s not perfect either. So I think 4,5 stars is still a pretty nice compromise. I just want to say I am beyond happy that we got this story. I never in a million years would have expected it, but we did and I am so grateful. I love reading it and experiencing all my Harry Potter loving feelings all over again. Yes, it is obvious that the book is meant to pull on all these heartstrings. It focuses on the right issues, it references the right scenes and the right characters to make every Harry Potter fan emotional. It is obvious and I don’t mind one bit because it works perfectly. I don’t mind that the plot may have a few holes and is not super awesomely great. I’m counting the feeling and the enjoyment this story gave me and that was just over the roof amazing. Starting with the epilogue scene was pure perfection! I LOVE that Albus is sorted in Slytherin. About time that house got a better rep. I ABSOLUTELY FELL IN LOVE with Scorpius from his very first scene. In fact, he’s my favorite character in the entire book. Hermione’s the Minister of Magic! I repeat, Hermione’s the Minister of Magic! I’m so proud of my girl! All the Ron/Hermione scenes are so pleasing to my shipper heart. Aww Draco! He just cares so much for his son. It’s beautiful and I am super happy they finally included him more in the group. Not digging the ponytail though. Seriously, who would ever have guessed that Draco and his son would be my favorite characters? Talking about favorite characters, I am sad that we didn’t get to see more of the Weasleys. Especially with Ron managing Weasley’s Wizard Weezes. But then again, maybe my heart couldn’t have taken that. So glad they finally adressed the use of time-turners. Plus it’s the perfect way to revisit some of our favorite scenes and characters. Who would ever have guessed that this story would be about trying to save Cedric Diggory? Not me! I loved the father-son issues that both Harry and Draco have and that it is what bonds them together. Really, I loved every Draco scene, but his scenes with Harry especially were so great. Words can’t express how much I love the friendship between Albus and Scorpius. However, am I the only one that ships them together? They just fit so well together. Sure, now Scorpius is all about Rose, but give him some time. He’s only in his fourth year and you don’t know what you want in your fourth year. I mean, Harry was in love with Cho in his fourth year. I’m just saying, things can still change and in my head it’s all about Albus/Scorpius. Overall, I just really loved this book. I laughed, I cried, I swooned. I’m just sad that it was such a quick read and it’s already over again. “Scorpius: Your dad thinks the rumors are true — I am the son of Voldemort? Albus (nods): His department are currently investigating it. Scorpius: Good. Let them. Sometimes — sometimes I find myself thinking — maybe they’re true too. Albus: No. They’re not true. And I’ll tell you why. Because I don’t think Voldemort is capable of having a kind son — and you’re kind, Scorpius. To the depths of your belly, to the tips of your fingers. I truly believe Voldemort — Voldemort couldn’t have a child like you. Scorpius: That’s nice — that’s a nice thing to say. Hermione: If this is your way of saying you want a marital break, Ron, then, to be clear, I will skewer you with this quill. Ron: Shut up. Will you shut up for once? I want to do one of those marriage renewal things I’ve read about. Marriage renewal. What do you think? Hermione (melting slightly): You want to marry me again? Ron: Well, we were only young when we did it the first time and I got very drunk and — well, to be honest, I can’t remember much of it and . . . The truth is — I love you, Hermione Granger, and whatever time says — I’d like the opportunity to say so in front of lots of other people. Again. Sober. She looks at him, she smiles, she pulls him to her, she kisses him. “Harry: You told me you don’t think I’m scared of anything, and that — I mean, I’m scared of everything. I mean, I’m afraid of the dark, did you know that? Albus: Harry Potter is afraid of the dark? Harry: I don’t like small spaces and — I’ve never told anyone this, but I don’t much like — (he hesitates before saying it) pigeons. Albus: You don’t like pigeons? 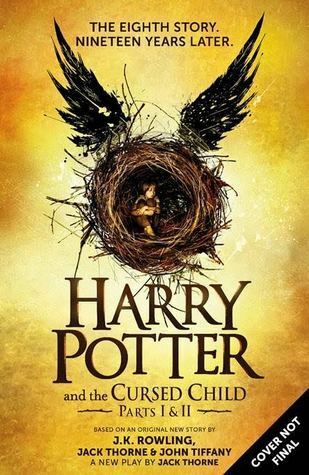 Have you read Harry POtter and the Cursed Child? What did you think about it? Great review, Lindsey! I definitely agree with everything you’ve said. I was not expecting to fall in love with Scorpius as much as I did. He’s definitely my new favourite. He and Draco, Snape and the Voldemort winning scenes were definitely some of the strongest points of the play! Even though I did have some issues it was such a magical reading experience. And, yes! Albus/Scorpius are totally my new OTP!! Thanks! Yes, the Snape and Voldemort winning scenes were definitely some of the best things! And Scorpius and Draco of course 🙂 It did have its issues but just to have been able to read a Harry Potter story again was magical!